DYNAMIC POS is intended for management of a fine dining or quick service restaurant, bar or pub, food court, take away outlets, home delivery etc. 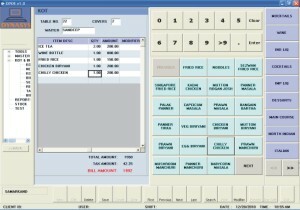 DYNAMIC POS developed in client server architecture. It is designed for minimum keystrokes. it minimizes the time taken in operations. Yet, it provides advanced features like Happy Hour Management, specify modifiers, give instructions to the kitchen. , apply discounts, split checks by category or item wise and multi-mode settlement.